I have been busy, mostly gossiping with other cripples. "predicted it would take me 3 hours to do the 75km. I was wrong, it took me 2 hours 59 minutes and 56 seconds but it was only 72km so my average was a little slower than predicted. The two climbs were *fantastic* with the second one being the better of the two. These are public roads and yet I saw 1 car in the first 27km and then only 4 cars in the last 40kms, none of which were on the climbs. The gravel was in *perfect* condition and I could ride the downhill sections very fast despite my speed being tempered by the knowledge of your recent misfortune. Fortunately I was wearing my protective lycra. Actually I got quite cold by the end, the sun sets earlier in the mountains and the road is in forest for a lot of the route. Did I mention how good the last climb was? I will definitely be riding Maruia Saddle again." A red bicycle. Mr. Knight's. 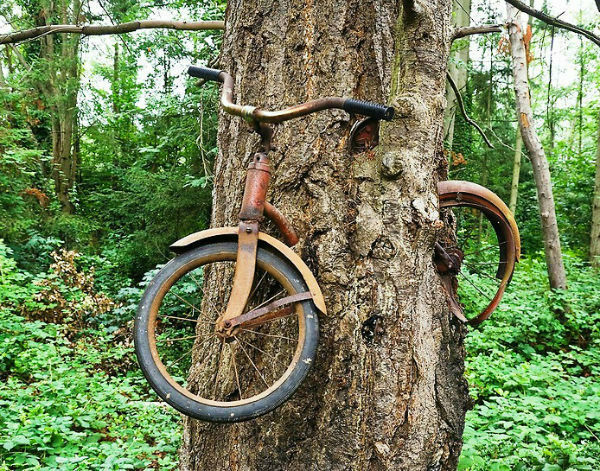 Mr. English, it will be recalled, got bored with aerodynamics & tried lignodynamics, the science of the resistance if you cycle through a tree. Site of Mr. English's excursion. Probably. Afterwards he used his recumbent tandem on a trainer for his exercise-based-pain-relief. He rested his left arm on a stool and sat and pedalled, and when bored used the same setup for arm exercise too - a chair in front of the bike, turning the cranks by hand. He couldn't pull back with the left arm (no bicep), but could do about 70% of the stroke, then carry it around with the right arm. Lots of ingenuity working out exercises - his therapist said he was the most inventive person she worked with in thirty years but then perhaps she didn't know that Mr. English was contemplating building a complete bicycle out of steel weighing under ten pounds. He now has some stiffness in the shoulder (not doing his exercises, bad boy) but the strength and function of his left arm is pretty much back to normal wi' just a slight reduction in range of motion. He has a band of numbness running down from shoulder into the pad of thumb and first finger, and after his flail chest, a complete recovery with no chest pain or breathing issues. My own progress comes on in little wriggles rather than leaps and bounds but I can now accomplish my right sock i'the mornings and therefore feel Very Proud. Anyone who can dress himself is a man to be reckoned with. And though a bit wobbly, I can now walk without crutches. For a dozen metres. But then I'm told to be sensible. The rehab business is interesting. My pain vexingly got worse as the normal leg muscles weren't getting properly worked, and they developed a tendency to go into spasm. An hour of cramp, hourly through the night is no fun, and painkillers don't work on cramping muscles. I was having to get up and do stretching exercises to stop my Achilles tendon contracting the whole time. That episode, thankfully, is over now that I'm walking more - already up to a couple of languid miles a day, pausing occasionally to watch some courageous soul from the aero college doing loop-the-loops in a Cessna. So despite an unuseful visit to the physiotherapist ("Mm, do those hospital exercises oh, until you don't feel like doing them. That'll be $25.") I am much encouraged and since Mr English is now winning the occasional criterium and beginning to train for time trials I am beginning to have faith in the chirurgeon's calm declaration that I'll be back to normal in four months. Accordingly I have resurrected the Penny Trike, and with a view to giving myself a gentle small pedalling circle, found a pair of cranks just 3 ½" long from an infant's bike. The cotter pins being all wrong some filing had to take place to get them to jam, and I had to make shims (beer cans, duly scissored) to achieve a decent fit. One side had rusted up and lacking a left-hand tap, I improvised one by heating an old pedal red-hot and plunging it into cold water to harden it, and then cutting half-a-dozen grooves across the threads with a Dremel. Worked tolerably well, too. Then to the business of chopping up the penny trike and re-welding it and including cross-plates inside the weld to stop it splitting later. 135 degrees. Plus my splendid feet. And now Mr. L. tells me Mr. Burrows has bust a femur too. Contagious broken skeleton syndrome. Thank you. - Yes: write. Write an awful lot, delete all the rubbish bits which (I find) are 90%, and leave the rest. Though since I haven't updated this blog in ages, perhaps I'm not the person to ask.